Were it not for a large sign at the entrance to the campus of Southeastern Guide Dogs in Manatee County, you could easily think you had arrived at an upscale junior college. A patio decorated with brightly colored dog sculptures leads to the two-story, glass-walled reception area of the Student Center. It is where those who are in training with their new canine companions live and work until graduation. The dorm rooms resemble a well-decorated hotel, courtesy of furniture company Rooms to Go, one of Southeastern Guide Dogs many corporate sponsors. Walk-in glass showers with rainfall showerheads invite relaxation along with fluffy towels and individual robes for each resident. The Zen-like atmosphere of cleanliness, quiet, and peace is cultivated; an important aspect of allowing human and canine to bond, especially for men and women who have endured the noise and chaos of war. John Taylor knows first-hand the scars combat can leave on one's psyche. Deployed to Iraq in 2010 and as a result requiring surgery in 2011, Taylor took medical retirement from the Army in 2013. He tried going back to school, but it was hard to fit in. He found himself staying in the house not wanting to be in stressful situations; his depression worsened. Then his psychiatrist suggested he might benefit from a service dog. Taylor decided to volunteer with Southeastern Guide Dogs. He cleaned kennels and gutters and did every odd job he was asked to do. And he fell in love with the dogs whom he felt could help bring him back from his dark places. He filled out an online application and eight months later, after an in-home visit by Southeastern Guide Dogs, he was approved for a match. Arla June, a petite yellow Labrador, and Taylor, who is tall and muscular, make quite a team. Taylor and his family are now able to go to Disney World, although passing children often have to be reminded not to pet Arla while she is working. A service or guide dog wearing a vest should never be distracted from their mission. Taylor wants other veterans with post-traumatic stress disorder to know that even though the process is rigorous, it is worth the wait to have a service dog. Jill Taylor, John's wife and mother of their two children, has been quietly listening. When asked what Arla’s presence has meant to their family, Jill’s eyes fill with tears. She says she has been able to return to school to study radiology and is looking forward to having a career, knowing her husband is safe at home. Suzy Wilburn, Southeastern Guide Dog’s Director of Administration and Alumni Support, is not only a manager of the organization, she’s a client. Diagnosed at age 27 with Stargardt's Disease, an inherited eye condition that results in no central vision, Wilburn, who had been an IT professional and international soccer player, became severely depressed. Wilburn found Lighthouse for the Blind, a Tampa-based nonprofit dedicated to helping the visually impaired lead normal lives. Through the Lighthouse's training, she found work with Florida’s Division of Blind Services in the HR department. It was there she learned how valuable a guide dog can be. She speaks of how they are capable of "intelligent disobedience.'' If the dog decides a command they receive is not safe, they won’t execute it. The dog is always thinking. Like John Taylor, Wilburn decided to volunteer at Southeastern Guide Dogs, eventually being hired as a full-time employee. The entrance to the 33-acre campus of Southeastern Guide Dogs in rural Palmetto FLService and guide dogs capable of changing lives don’t happen by accident. They are the result of studied scientific genetics and breeding, and careful personality analysis from birth. Kim Hyde, Manager for service dog training, says Southeastern Guide Dogs is looking for intuitive dogs who are people-oriented, want to please, and will be responsive to signs of fear and depression. Hyde is an expert on the subject of guide and service dogs. She wanted to be a guide dog trainer from the time she was 10 years old and started raising guide dogs as a youngster in 4H. It is not only the dogs that need to be intuitive. The matching of dog to human is as much art as science. Before a student arrives for training, they have been preliminarily matched with three dogs. Factors that go into the equation are the student's lifestyle and energy level. Does the student need to be calmed or energized? How mobile and independent is the student? All disabilities are taken into account. Do they have hearing loss and need a dog that recognizes sounds? Does the dog need to alert when a seizure is coming on? Does the student have balance issues and need the dog for stability? All these factors are considered before the final match is made. The work of Southeastern Guide Dogs is serious business; it affects the lives of people who, like John and Suzy, might have otherwise lost hope. But there is a place on the Southeastern Guide Dog campus where smiles come easily: the new state-of-the-art Puppy Academy. 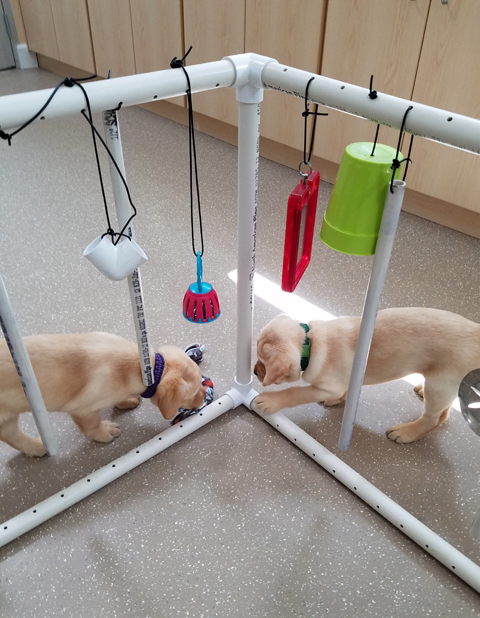 From the neo-natal unit that appears to rival any human hospital, to the whelping center where mothers stay with their pups for six weeks, the Puppy Academy is where the lives of Southeastern Guide Dog’s service and guide dogs begin. Zuhey Medina-Gonzalez, director of genetics, reproduction, and puppy care is in charge of providing the best possible dogs for training. She says she and her team are looking for dogs that love attention and love to work. After being weaned, pups go to "puppy kindergarten'' where they are trained with an "activity box'' filled with stimulating objects and are observed for traits like impulse control and acceptance of a crate and a leash. At 12 weeks they get their sponsored name and are given to a "puppy raiser,'' someone who socializes the dog into their family while teaching them good manners. Puppy raisers, who are located across the South and Midwest, are an important part of the Southeastern Guide Dog volunteer program. They meet with their area coordinator and fellow puppy raisers twice monthly and bring in their pup for regular vet checks. More information on becoming a puppy raiser is available at this link. For all the work and expertise that goes into raising and training Southeastern Guide Dogs, it all starts with their breeding. Yellow Lab puppies attend "puppy kindergarten" before they can become service or guide dogs. In the Puppy Academy, an entire room is dedicated to keeping track of pedigrees in order to make breeding decisions, including a relational database that involves 29 other breeding programs around the country. The facility also includes a cryo-tank in which frozen sperm is kept for future use. Dogs in the Southeastern Guide Dog breeding colony go to “Breeder Hosts” where they live as well-loved pets with a family until they are needed. Southeastern Guide Dogs is located on a scenic 33-acre campus in rural Palmetto, FL. Founded in 1982, the organization started in a rented house in what was then a cow pasture. Today the facility includes the Barpal-Hirst Student Center, Keith G. Hirst Canine Assessment Center, Grant and Shirle Herron Puppy Academy & Gift Shop, Barpal Veterinary Center, and under construction, new Canine University and kennel facilities. Southeastern Guide Dogs receives no government or taxpayer funding and never charges a fee for its services. It continues to grow through the support of the public and generous private and corporate donors. Tampa Bay Trust Company, under the direction of its CEO, Terence Igo, is one of those corporate donors. Tampa Bay Trust’s corporate culture of giving back to the community supports over 100 nonprofits on Florida’s west coast. Igo says that Southeastern Guide Dogs was chosen because of their direct impact on people’s lives, particularly our veterans. In addition to corporate and private donors, Southeastern Guide Dog’s largest public fundraising engagements, Walkathons held throughout the Tampa Bay Area, raise about $1-million each year. There are also naming opportunities: For a donation of $5,000, you may name a dog in honor of someone or something meaningful in your life. As a 501(c)3 nonprofit, the organization is highly rated by both Charity Navigator and Great Nonprofits. 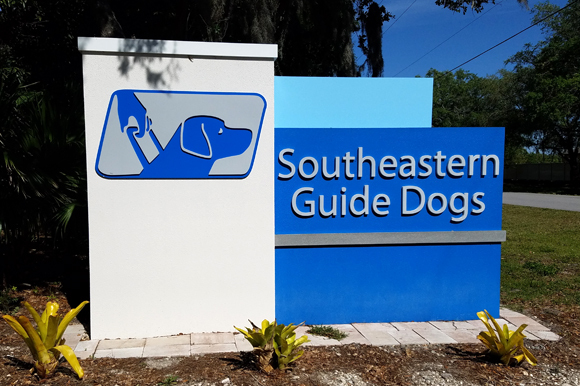 The public is encouraged to visit the Southeastern Guide Dogs campus to enjoy guided tours and multi-media presentations. You can even teach your dog a few tricks in Southeastern Guide Dogs' highly rated dog training classes. Reservations for tours and training are necessary and can be made on the Southeastern Guide Dogs website. A small fee is charged to cover expenses. Southeastern Guide Dogs is dedicated to raising and training service dogs that provide freedom, confidence, courage, and hope for people who cannot see and for veterans who have seen too much.